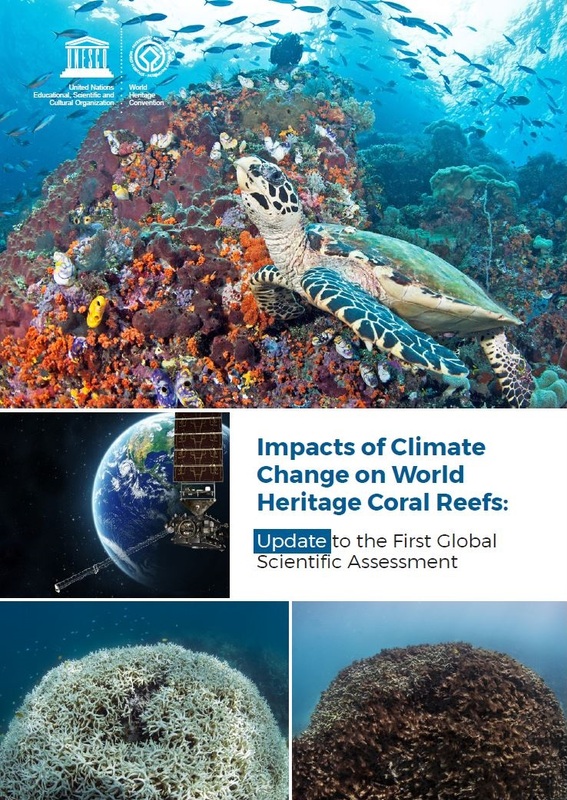 Today, the UNESCO World Heritage Centre released an update to its 2017 first global scientific assessment of the impact of climate change on UNESCO World Heritage coral reefs. The latest update concludes that limiting global temperatures to 1.5°C degrees above pre-industrial levels would mean World Heritage-listed coral reefs are expected to avoid severe annual bleaching this century. Together with appropriate management of local pressures, this would allow reefs to continue to provide the vital ecosystem services including food production, coastal protection and recreation to future generations the way we enjoy them today. Led by NOAA’s Coral Reef Watch, the update forecasts the effects of heat stress on the 29 reef-containing UNESCO World Heritage properties under a Representative Concentration Pathway RCP 2.6 scenario, in which global temperature increase would be limited to 1.5°C degrees above pre-industrial levels. Under this scenario, which reflects the long-term term target under the United Nations Framework Convention on Climate Change (UNFCCC) Paris Agreement, exposure to annual severe bleaching would likely be prevented this century. Furthermore, nearly all of the 29 analyzed World Heritage-listed coral reefs (86%) would escape twice-per-decade severe bleaching this century and thus secure a sustainable future for the planets most iconic reef systems. says Dr. Mechtild Rössler, Director of the UNESCO World Heritage Centre. Heat stress events have increasingly caused severe coral bleaching and mortality of World Heritage-listed reefs around the world over the past three decades. During the 2014-2017 global mass bleaching event, at least 15 World Heritage-listed coral reefs were exposed to repeated severe heat stress, with mortality rates in some locations among the highest ever recorded. Bleaching and mortality of corals due to heat stress are expected to continue and intensify in the coming decades unless carbon dioxide (CO2) emissions are reduced drastically. Under “business-as-usual scenario”, all 29 World Heritage-listed coral reef properties are expected to experience annual severe bleaching this century, leading to dramatic deterioration in ecological functioning. Many of them are expected to cease to host functioning coral reef ecosystems under such scenario. The update was produced in response to World Heritage Committee Decision 41 COM7 (Krakow/UNESCO, 2017) to make available the most current knowledge regarding the impacts of climate change on World Heritage properties. It also responds to the 2017 “UNESCO Strategy for Action on Climate Change”, adopted by the 39th session of the UNESCO General Conference, in particular by raising awareness on the impacts of climate change on the world’s natural and cultural heritage. Work is currently underway to revise the World Heritage committee’s policy on climate change. This report benefited from in-kind support from the United States National Oceanic and Atmospheric Administration (NOAA), the University of Miami, and the University of Colorado for which the World Heritage Centre is grateful.